According to an extensive series of studies conducted by Nielsen Norman Group, it is estimated that the bandwidth requirements of users grows by roughly 50% with each passing year. In the simplest terms possible, if a user required 100 megabytes of bandwidth today, they would require approximately 150 megabytes to perform the same basic functions one year from now. This rule rings true across the board - from home users to students to the ever-changing world of business. How Much Internet Bandwidth Does My Company Need? This question does not necessarily have an easy answer. It requires you to take a look at the several key factors that impact your speed and bandwidth requirements and assess your current usage levels for each. Thanks to advancements in modern technology, collaboration is easier than ever. You can now e-mail that project to a team member to get feedback, upload a document to cloud storage for safe keeping or download the latest set of revisions from the company FTP server before client approval. All of this comes with a cost, however, in the form of bandwidth. Every time a file is uploaded or downloaded, your bandwidth requirements go up as a result. Customer relationship management services have become the norm in a broad range of different industries. Likewise, many companies are turning to innovative cloud solutions like Microsoft Office 365 for collaboration, and cloud hosted services for backup and archival purposes and more. Every time you interact with the cloud, however, information is being uploaded and downloaded. Your bandwidth requirements are only increasing as these services become more and more prominent. By far, one of the most bandwidth-intensive activities that most businesses engage in involves the streaming of high definition video and audio content. Uncompressed, HD video has an average file size of 10 megabytes per second. By the time you finish watching a one-minute video from a prospective client, you have used up nearly 600 megabytes of bandwidth. Your bandwidth requirements for video conferencing, VoIP telephone services, webinars and more are all very similar in nature to HD video and audio streaming. They all require an enormous amount of bandwidth to deliver the quality that your business can depend on and that your clients have come to expect. Software developers routinely release updates to their programs to help address issues that users are experiencing, patch security holes and more. Downloading these updates is one of the keys to making sure that your business remains safe from backdoor threats, malware and more. It also means that your bandwidth needs are increasing every time a software update becomes available. Operating systems like Windows and OS X are adopting auto-updates, which run in the background. Several computers doing this at once, on sizeable updates, could put quite a strain on bandwidth. Viruses, malware and other types of malicious programs are another one of the most common uses of bandwidth in a business environment. These types of programs transfer an enormous amount of data in the background, often without the user ever realizing it. If your company network is hit with a virus, your bandwidth use isn't necessarily your highest priority. However, the "software as a service" antivirus solution that you're using to get that virus off of your network will also use a great deal of bandwidth to accomplish that goal, too. Because mobile devices have become such a prominent fixture in our lives, "bring your own device" scenarios are more and more common in today's modern business environment. Every smartphone, tablet or another type of device that is connected to your work Wi-Fi, however, represents a new "user" with its own unique set of bandwidth requirements. As smartphones get faster and become capable of more and more things, you can expect this category to grow in prominence sooner rather than later. The key takeaway from all of this is simple: the answer to the question "how much bandwidth do I need for my business?" is one that will change with each passing year. As a result, you always need to be thinking about both your short-term needs and your long-term goals before you make any decision. If studies are accurate and Internet usage is doubling every year, you do not want to lock into a rigid, two-year contract with a provider. You could end up with an outdated contract with speeds that are inferior by the end of your contract. 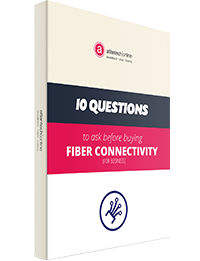 Before you invest in any Internet solution, you need to talk to a trusted advisor who knows business fiber Internet connectivity inside and out. Based on your current usage trends and industry statistics, they'll be able to give you an accurate calculation of how much bandwidth you need today and, more importantly, how much you're going to need tomorrow. This advisor will also be able to help you accomplish the most important thing of all: develop a solid plan for growth in the future. This plan will make sure the business you're running is more successful and more capable by preparing for growth.